My brain is still on vacation....Catching up in bullet points. --Thanks so much to Steve and Laurie for time away. What a blessing to pretty much do nothing for an entire week. A huge shout out as well to the "village" (literally) that made it possible for this mommy to farm out all four kids...and no one missed a homework assignment, soccer/lacrosse/gymnastics event. --I would post pictures of us in Tennessee, but my husband is hoarding them on his zip drive. Here's one of Theresa (my sweet friend and UF apartment mate) who drove two hours to come and have lunch with me! --How can you not love the Internet?!? Thelma and Joy, thanks for taking the time to drop me a note--it made my day! Joy--I'll be in Phoenix in January to sign books and speak and would love to see you then. --I heart the 'net part two. Who would have thought that a bunch of thirty-somethings would be such Facebook addicts? (We only really keep accounts to monitor our kids, you know!!). I am loving catching up with old friends and got to have supper with my "little brother" from OT school and his lovely wife on Saturday. They live just a short drive away, and we're so looking forward to renewing our relationship with them! --My girls are gone this week. PP is at her grandparents' in Sarasota. TQ just got on a plane (no longer on unaccompanied minor status--gulp. Am I the only overprotective wuss parent here?). She'll be getting the star treatment from her NY grandparents this week--a celebration of her 13th birthday. --Looking for something less fluffy? 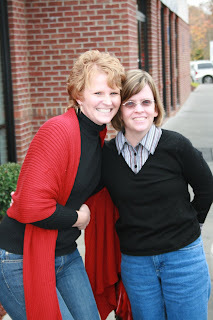 I'm guest posting at my friend Christina's blog this week. Go say hi to her. We are going to spend a week in a cabin in Tennessee courtesy of our dear friends Steve and Laurie. That's right, a week sans children. Missing me? Go check out my interview on the Every Square Inch blog. It's good stuff. Drop the team a comment while you're there! Have a great week. I'll check in when and if we get a wifi fix! Pray. Vote consciously and intelligently. Leave the rest up to God...He's got it under control, come what may. Let me start out with this: over the years, we've been all over the map in our views on/participation in October 31. We've done trick or treat, we've stayed in with the lights off, we've gone to "alternative" festivals, we've celebrated Reformation Day (by far my personal favorite). I think at some point I decided that attending an alternative was still celebrating/recognizing the day...and that getting out and having fun/interacting with my neighbors was a much more effective evangelization tool than sitting in the dark. So, we trick or treat at our house (although, if we had a Reformation Celebration to attend, we'd do that!). I also love the idea of "reverse trick or treat" that Susan's church participated in this year, and plan on making that part of our festivities next year. This year, we had the preschool costume parade on Thursday. Friday, the elementary school had it's "Parade of Books". Friday evening EJ headed out with his friend to set up for the local church's big "Trunk o' Treat" celebration, while the littles and I enjoyed a pizza from Aunt Sarah and costumed up. Daddy got home with the TQ just in time to grab a bite and head out to the festival with us. TQ stayed behind to clean up after soccer practice and hand out candy. The festival part was loud, but fun. When the candy handout started, however, we stayed in line long enough to let EJ hand some out to his brother and sister, then headed home. The crush of people (over a thousand turned out!) proved to be just too much for our sensory-overloaded little guy. We headed back to our neighborhood. Sadly, most of our neighborhood doesn't appear to have been educated in October 31 etiquette. We went to houses with porch lights on to find no one answering the door. We met up with friends who left a bowl of candy on their porch had returned from taking their own children out only to discover the entire bowl and it's contents had been stolen. We did encounter some lovely and pleasant people as well; but overall, we had fewer visitors, and the neighborhood was much quieter than last year. We arrived home for the great candy sort. In addition to the goodies from the festival and their neighborhood rounds, they had a beautifully wrapped baggie of treats each. When this baggie was was opened, we discovered not only candy, but an article photocopied from a religious publication. It informed us that (I'm paraphrasing) good Christians didn't participate in "Satan's playground" nor did they expose their children to this type of thing. Oh, and that if we wanted more information on "good" Christian parenting, we could send money to a certain organization and receive a book. I was gobsmacked. I respect these people's right to have an opinion about Halloween. As the body of Christ, we're not going to agree on everything...and I'm sure as they passed out their little bags of condemnation, their intentions were good. But the sugar that came with the message didn't make it any easier to swallow. --This would have been a great time to tuck in an invitation to a church, a tract that presents the gospel, or even a "This is who we are, neighbor, come and get to know us..." type message. I may have to do this next year, along with the reverse trick or treat. --Not to be trite, but What would Jesus do in this situation?